Food. I live for it. I exercise like crazy so I can keep eating. I love to eat different things, especially when I leave the country. Give me the national dish and the local special - I love going to The Netherlands to see Seeg's family partly because of all the food!! Slavink, spekkoek, kruidnoten - it goes without saying that I always gain weight when I go there, and I never regret it. But it's not just junk food, of course. I'll eat whatever is put in front of me - I will clean my plate. If we go out to a restaurant, I'll choose the most alien thing on the menu, or at the very least something I don't see very often. Smoked eel, blood sausage, venison, rabbit. I love herbs and spices, too, because they can completely shake up a dish when you're cooking at home, and I love cooking! And so, though it may be obvious to you, I've realised that this is more or less the definition of a foodie. And so I thought I'd put a gift guide together with all the lovely things I've found that have either caught my eye or found their way into my shopping bag. So if you're looking for great gifts for your foodie friend which will really catch their attention, then pay attention! Cookbooks! But not just any cook books! (1) North; The Nordic Cuisine of Iceland features recipes from the Nordic cultures of Iceland, giving any seafood lover a great stock of new dishes to try out, while (6) Eat Grub features all kinds of unusual recipes involving...less obvious ingredients. Insects, really. So it's certainly a cook book for an outgoing foodie! And of course every cook needs an apron, and (2) hot stuff is always coming through - even if it's just to fetch the lemon that fell off the counter and somehow rolled out into the living room. And for the experimental cook - because spices can completely redesign a dish - a spice gift set featuring (9) spices from Africa and the Middle East makes a wonderful addition to the kitchen. Not to mention it's beautifully presented in a tin and handmade silk wrap. And just as every chef needs an apron, they also need a chopping board, so how about a (4) stylish eco-friendly marble chopping board? It's great to chop on, but also great as an "I just threw it together, I'm not really trying" serving platter - and a wonderful (8) heart-shaped olive bowl with picks for entertaining the guests while you just "throw" something together, disregarding the recipe's three test-runs in the kitchen over the past week, and the guests giggle at the really rather random but "so you" (7) artichoke candle holder. But not every foodie is interested in cooking, nor entertaining. Sometimes it's just the eating we want to do, and I fall into that category sooner than any other. So this (3) bespoke gourmet brownie gift box naturally caught my eye, as did the ice cream which in turn encouraged my eyes onto the (10) 'calories don't count on this spoon' utensil stuck in it. And having shared a lovely lunch of mussels with Seeg recently, I tracked down these (5) silver plated mussel eaters because I now know how to eat them, and feel both fancy and barbaric while doing so. 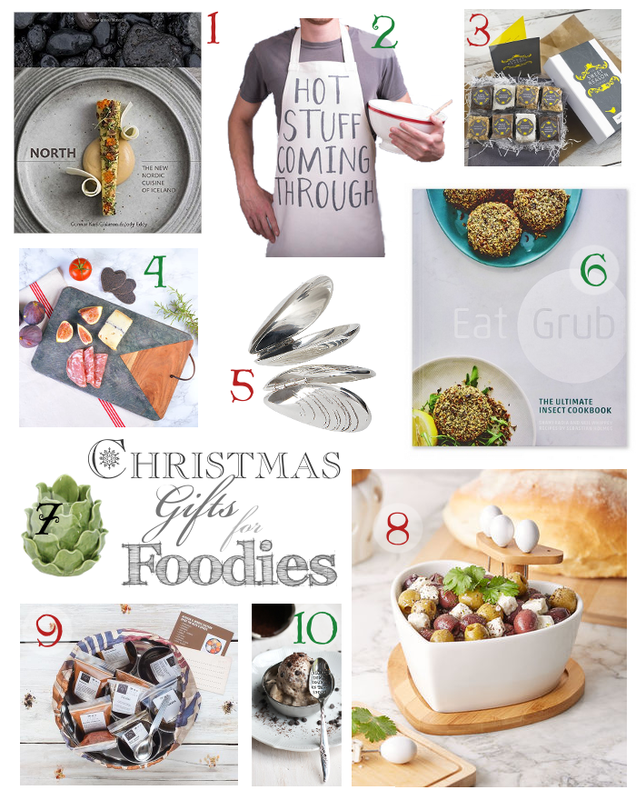 I put this foodie gift guide together myself. None of the products, brands of websites featured have given me any kind of incentive to include them on this list, they are here purely because I want them to be. Please note, however, that I am not affiliated with any of the brands or websites and neither do I endorse the products. Good luck with your Christmas shopping!